Though sold and marketed as a portable device, I’ve recently been intrigued by Philips’ new DCP850 DVD player with integrated iPod dock. 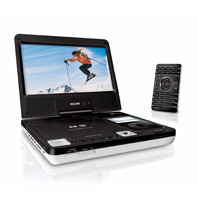 It boasts support for standard DVD, DVD+/-R(W), VCDs, DivX files, MPEG-4 files, compact discs, MP3s and photos. It also features an SD/MMC card reader for playing movies and photos via a memory card. The iPod dock, of course, charges the iPod and allows access to and playback of all the content on it. It’s not fancy wireless like the Apple TV, but the DCP850 certainly seems more versatile. At $199, it’s $100 cheaper than the Apple TV as well. Using standard A/V cables, the DCP850 can be connected to a television and I’m thinking I might eventually replace my DVP642 with it in my set-top setup. Being portable would just be a seldom-used perk. The device will accept and play all the DVDs and DivX files I currently have in my collection, plus any videos on my iPod, which tend to be transitory M4V files. And the SD card reader opens up a lot of possibilities for replacing the CD-RWs I currently use for temporary AVI files and non-H.264 M4Vs as well. At the moment, the DCP850 is so new that there’s not a lot of real world reviews of it, but I’m certainly keeping my eye on it. Star Trek sold out at iTunes Store? UPDATE March 26: After nearly a two month stint of being offline at the iTunes Store, the Star Trek TOS is back. The complete first season is available in its original broadcast form. Additionally, newly remastered episodes from the first season are available in their own section. iTunes is still the only source for them in their uncut form. Star Trek tv shows are suddenly missing from the iTunes Store. Both the Original Series and Enterprise are completely gone. The movies are still there though. I wonder what’s up with that. Seriously though, this is surprising. I don’t have any figures, but I bet the shows were selling well. Especially the new remastered episodes that were available. The iTunes Store was the only place to download uncut versions of select remastered episodes. According to the boards at startrek.com, the eps were pulled for a “technical reason.” We’re left to speculate what that actual reason was, but it would be pretty swell if CBS and Apple were building a Star Trek portal/store-within-a-store/wormhole inside iTunes. In addition to their world-sized beats, The Chemical Brothers are generally known for their world class videos. I stumbled across this video to Star Guitar from the duo’s 2002 release Come With Us while perusing the ol’ Google Video/YouTube library this afternoon and was quickly fascinated. It was directed by noted film dude Michel Gondry, who’s done some impressive work, including intriguing videos for Bjork, Beck, Radiohead and many other musicians, as well as numerous innovative television commercials. But he’s also responsible for pioneering “bullet time” cinematography, so negative points there. Of course, the concept of synchronizing visuals with the rhythm of music isn’t exactly new, but the execution here is clever. Though by the end of minute three, you’ve pretty much gotten the point and are ready to move on. Songs that sound too similar to be coincidence. This one is quite surprising because I never ever would have guessed the source. A couple years ago, while sifting through the Italian Cinema dump, I stumbled upon a track by composer Mario Molino that sounded just a wee bit familiar, like a demented, psychedelic version of a song I knew all too well. It was the title track to a 1969 Italian film called Gli Angeli Del 2000 plot summary not available and it boggled my mind. Listen to it for yourself and tell me that it’s not uncanny. Go on, I’ll wait…. All done? Good. Those of you who are acquainted with a device commonly known as a television (or “T.V.”) will most likely recognize some major elements to the theme song from Matt Groening’s Futurama program in that. Those of you who aren’t able to recall that theme, here’s a reminder. It’s an extended version by show composer Christopher Tyng himself. At the time I first noticed the similarity, a discussion board (or other similar web page) told me that Gli Angeli Del 2000 was a direct and deliberate inspiration for the Futurama theme. I can’t locate that source now, but I’m going to take my memory at its word. That’s good, because no matter how much I like the theme which is a lot, that source is the only thing that’s stopping me from claiming rip off. Update and correction 7/19/07: In the comments below, moogaloo, corrects my above assertions. The Futurama Theme song was derived from a Pierre Henry’s Psyche Rock (1967), not the above Molino track. I had completely forgotten about Psyche Rock, and thus confused it for Gli Angeli Del 2000, which appears to be the true rip off in this case. But now that I’ve been reminded, I recall from the commentary on one of the Futurama DVDs that the producers wanted to actually use Psyche Rock as the theme, but couldn’t get the rights. So the producers decided to “pay homage” to it instead. For some additional coincidences, check out a universal favorite: Louie Louie by The Kingsmen (1966). You can hear the similarity in the chord progressions and the back beat. Who would have thought that the humble Futurama theme would have such a long and illustrious pedigree?